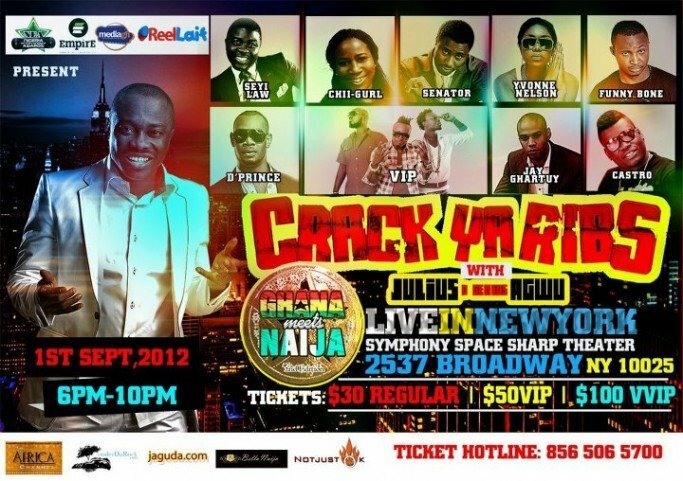 FAB News: Ghana Meets Naija With Julius Agwu In London, Houston,New York And Dallas. Having earned his stripes as far as entertainment business is concerned; Julius Agwu remains one of the most sought after comedians in Africa. His comedy concerts are always hilarious and fun-filled. This summer, Julius ‘D Genius’ Agwu will be performing live alongside other Nigerian ace comedians in New York, Houston, Dallas, Glasgow and London. The comedian and his team who have been hosting the Crack Ya Ribs Comedy Show annually in London have decided to take the show to other cities. The concert will feature grand performances from both Nigerian and Ghanaian artistes, Over a decade, the Crack Ya Ribs brand from the stable of ReelLaif entertainment headed by Julius Agwu, producers of Laff for Christ’s sake and Comedy Train started in 1994 and has gained lots of popularity in London and Nigeria. “this year will mark 12 years of Crack Ya Ribs and we needed to repackage it to inject some fresh ideas to keep the brand going. We are now trying to make it bigger by turning it to a Pan-African event. So we are doing this edition with Media Ghana and Empire Entertainment from Ghana. They are the organizers of Ghana Meets Naija music concert in Ghana and they are my Ghana partners for this year’s concert’’. The London show will hold on August the 26th, 2012 at the Light House Hall, 262-274 Camberwell Road, SE5 ODL, which happens to be the same venue where Laff for Christ’s sake show held in April 2012. Artistes and comedians billed to perform at the London show include D’Prince,Funny Face from Ghana, Seyi Law, Dj Abass, FunnyBone, Senator and MC Shakara . Top Ghanaian acts like Guru and Khaki will also be performing at the event. While the New York and Glasgow shows will hold on September the 1st, 2012 at the Simphony Space Theater, 2537 Broadway, NY 10025 and August the 24th, 2012 at O2 ABC 2 Glasgow respectively. Houston and Dallas are billed for September 7 & 8 respectively. 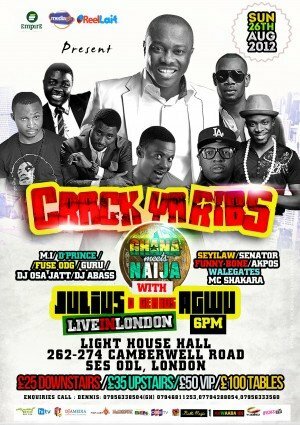 Crack ya Ribs – Ghana meets Naija with Julius “the genius” Agwu in London. Julius "the genius" Agwu in New York, Dallas.